Use one keybard, Mouse and monitor with two computers. 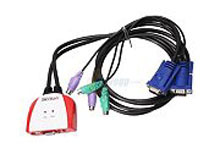 There are others that allow you to connect those and the Audio also, they run anywhere from $15.00 into the thousands, do a search for KVM Switch at Newegg.com. There are also wireless versions too!